I love tomatoes. 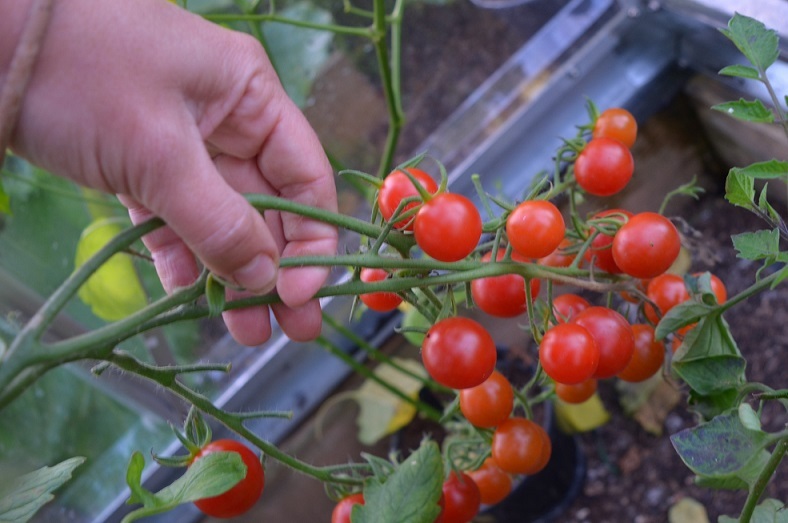 Even now, at the height of glut season, when nearly every kitchen surface is littered with bowls of glowing, ripe fruit, and the greenhouse plants are still producing them at an alarming rate. They’ve been sauced, souped and eaten in salads. I now harvest them by the gravel tray, rather than dainty little supermarket punnets. Given that my previous (and current) outdoor crops have been reduced or wiped out by blight by now, it’s a great problem to have. The majority are open-pollinated varieties, not just because of my seed-collecting habit, but also because of their sheer variety. 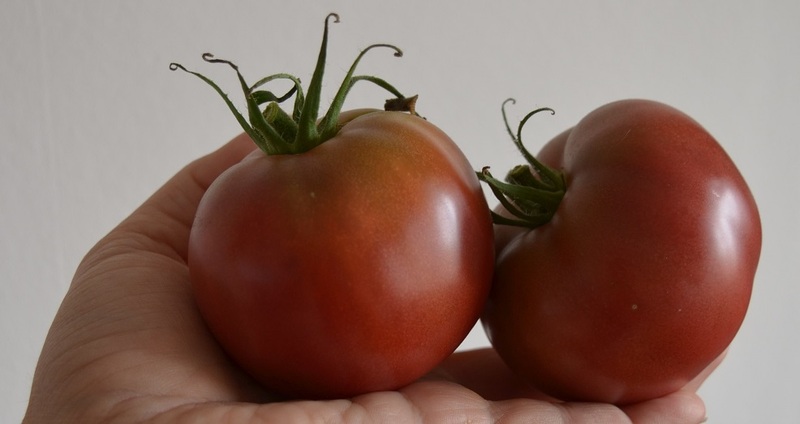 Tatiana’s tomato database lists nearly 5,000 different varieties from across the world – which I can’t hope to get through in my lifetime! This year I grew 16 different varieties, some new, some old and some which are, quite frankly, bog-standard. All bar the tumbler were in the ground and they were nearly all cordons so I could get more plants in. In case you’re as bewildered by choice as I am, here are my reviews, with pictures. Some of the trusses are missing fruit. They either didn’t all pollinate, or I’ve eaten them. 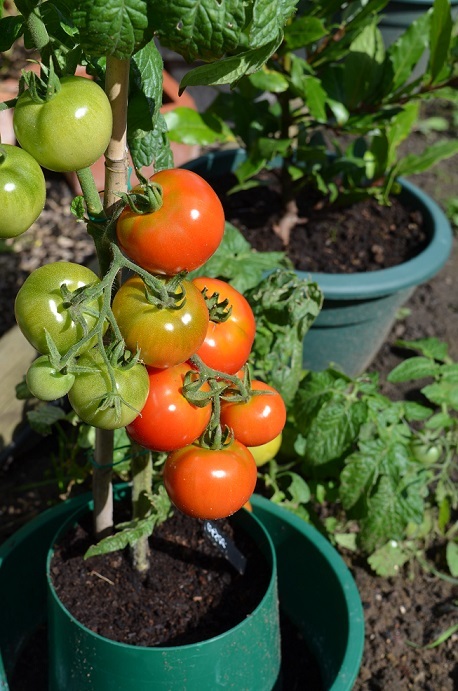 This produces lovely dark cherry tomatoes with a really deep tomato flavour. Mine are intent on growing sideshoots and have split into 3 vines. Those have nearly all hit the roof of the greenhouse. Yield is pretty good, though better on one plant on the west of the greenhouse than the one on the east. The only thing is the colour – Small Child thought they’d gone off and took a little convincing to eat them. Will I grow next year? Yes. 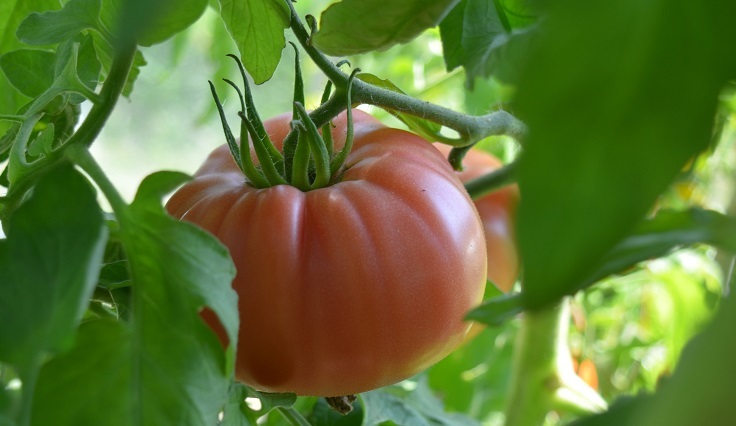 Large dark tomatoes which have a deep smooth flavour, perfect for mozzarella and basil. There aren’t many per truss, and because they are so big the trusses can need supporting too. I missed one of the sideshoots on this plant and have a double cordon. The plant wasn’t the strongest growing, but it was next to a Katya which was an absolute beast. It’s not the strongest of growers, indoors or out. It’s on the spindly side. 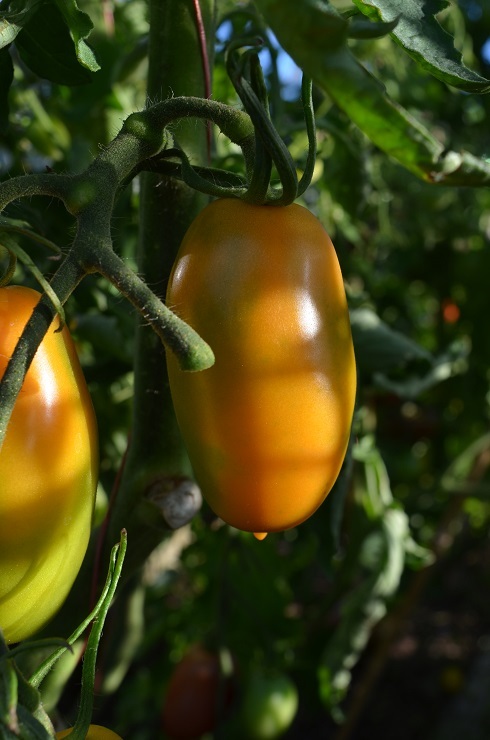 But the tomatoes are stunningly beautiful to look at and you get up to 20 per truss. Elongated yellow cherry plum, with streaks of red. They taste lovely – slightly acidy rather than overwhelmingly sweet. I got them from the A4A seed circle in 2014 and they are going straight back into the circle I am running! These purport to be blight-proof. I got 2 free trial plants from Dobies through John Harrison’s newsletter offer. They are both outside to give them a proper test against blight. One of the two is growing strongly, the other is completely rubbish. Both set trusses with few fruits and of variable size, which taste very good. 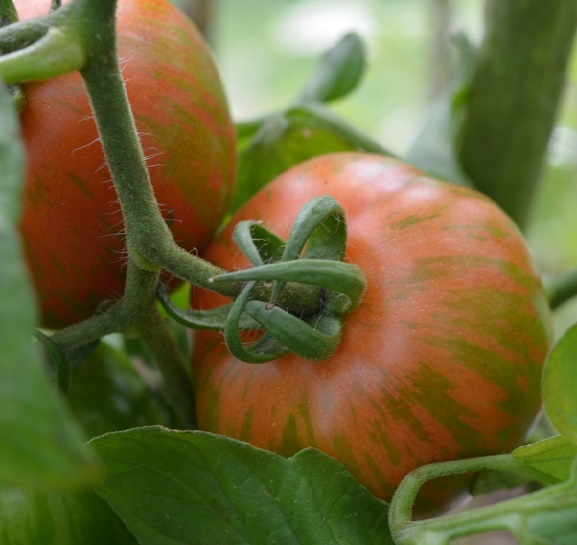 The variety in size makes me wonder if it might not yet be stable as a cross – some are definitely beefsteak in girth & shape… As of September all my other outdoor tomatoes have blight and the CC plants are showing a few patches but growing through it. Will I grow next year? Yes, if the sideshoots survive over winter. I have one inside and one out. 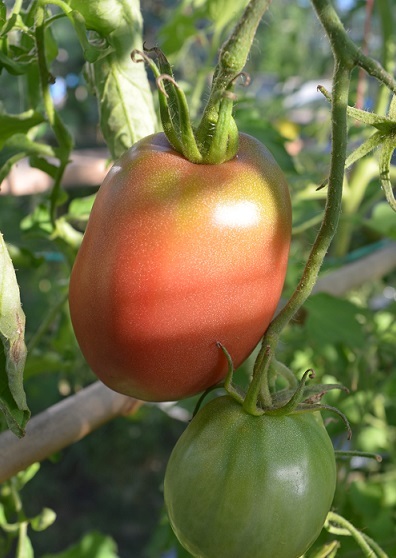 Both are very sturdy plants with dark curly leaves and trusses of 7-18 fruits. 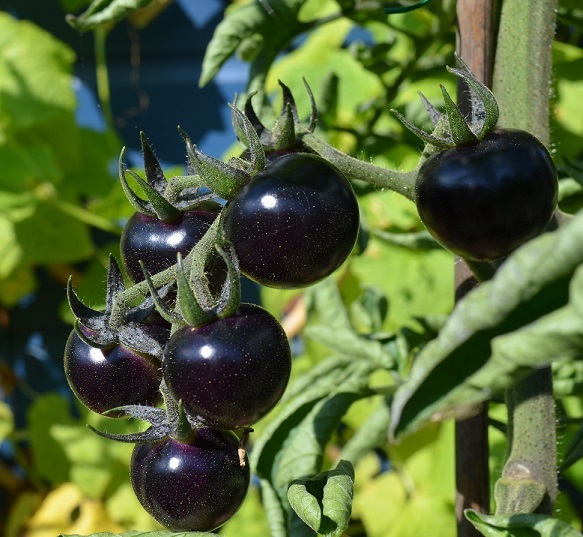 Tastes nice – the anthocyanin flavour (the natural pigment which colours the fruit) is fairly distinct. 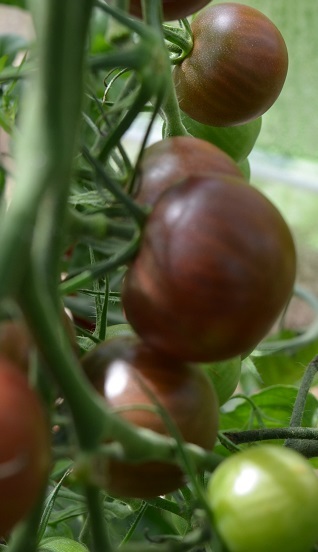 The tomatoes are blue-black where they are in direct sunlight. The ones I grew outside faced south so had very little skin that was not black. You had to be a bit of a contortionist to see if the shaded side was changing to red. Definitely fun to grow, especially for kids. Will I grow next year? Maybe, just for the colour. I didn’t think I’d like this, but I do. My plants are now 7ft high in the greenhouse and showing no sign of stopping. 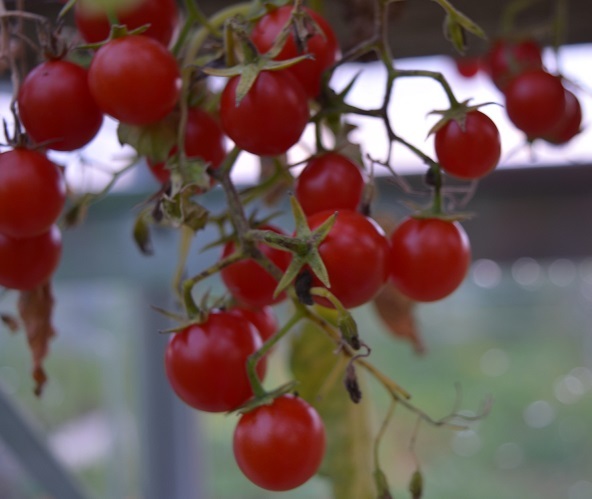 They have large trusses, with large cherry fruit that has a proper deep tomato flavour – am saving seeds from this though probably I won’t grow them next year. Will I grow next year? Maybe. 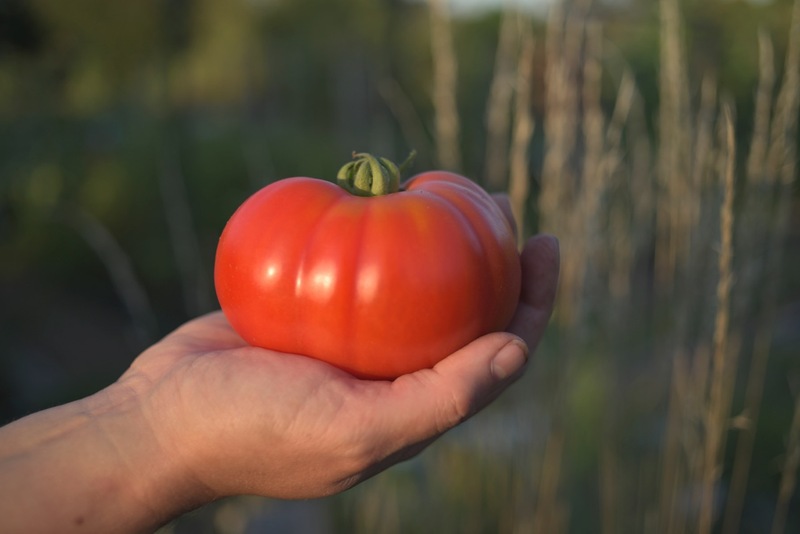 This produces massive trusses of sweet grape-sized tomatoes on a fairly sturdy plant – the one in the photo had been harvested a fair bit. I have plants inside and out. 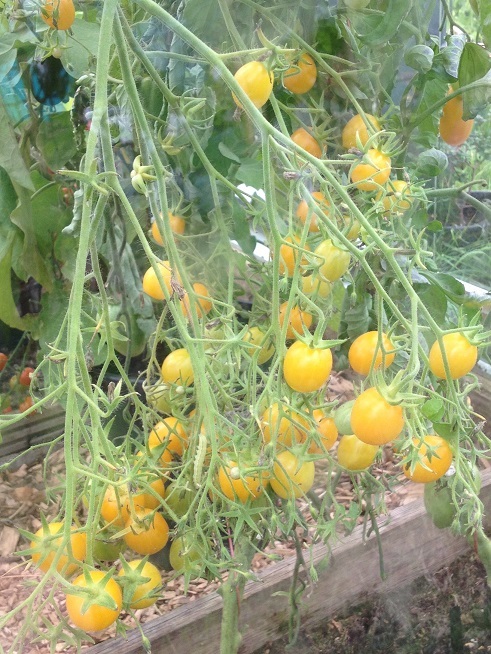 The tomatoes are ripening steadily in the greenhouse and are still green outdoors. The trusses don’t need supporting indoors though outside it is helpful. 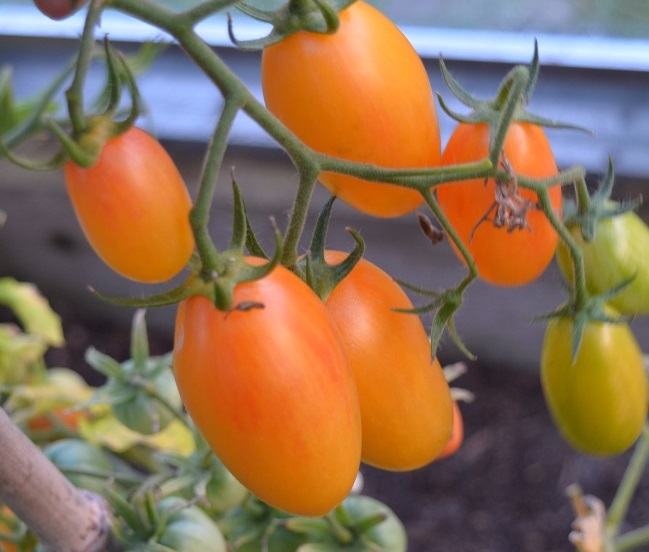 Am not sure the flavour is all that, it gets a bit washed out unless watering is very careful, but you definitely get a lot of tomatoes from one plant. The greenhouse plant stopped at about 5ft tall, with 3 good trusses. I daftly planted it in the middle of a row, meaning I had to shimmy past to get through to the back. Won’t do that again. Will I grow next year? Yes, but in a corner at the back where it has space for the trusses to grow. Will I grow next year? Probably not – I want to try Brandywine next year after reading rave reviews. But I am keeping seed for another year. Will I grow next year? Yes, definitely. Will I grow next year? No – mainly because I save seed so try not to grow many F1s. Will I grow next year? Hell yes! This was only grown outside, and it wasn’t really happy there. It was spindly, the tomatoes were really small cherries and they didn’t really wow me flavourwise. It’s supposed to have a dusky pink colour, but it didn’t for me – I’d describe it more as brown. 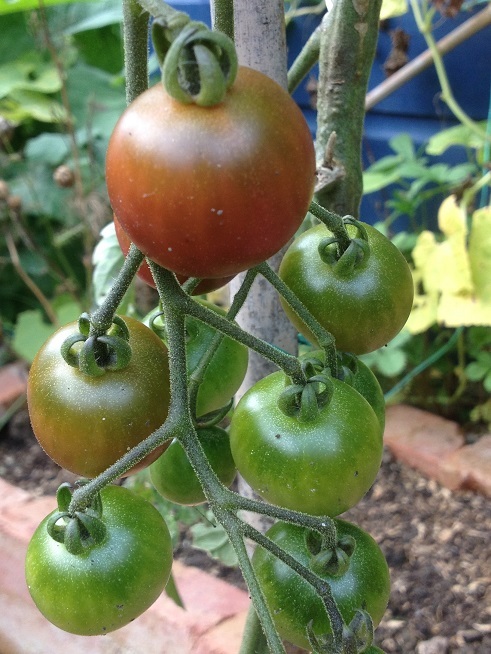 This is an ultra early dwarf bush tomato that I stupidly thought was a cordon – so I have small plants with not many fruit. Doing well inside and out. 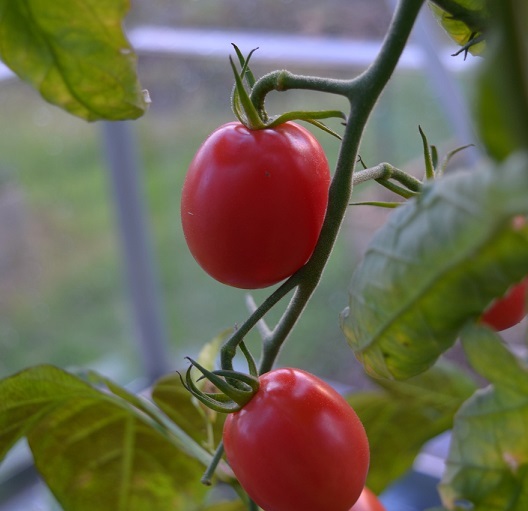 It has small salad tomatoes and the whole plant ripens almost at once. The tomatoes aren’t good keepers but taste fine – they are a bit bland but I’ll forgive them that for their sheer earliness. Seeds from the A4A circle and are going back into a couple of others this year. Will I grow next year? Maybe, just for early tomatoes. 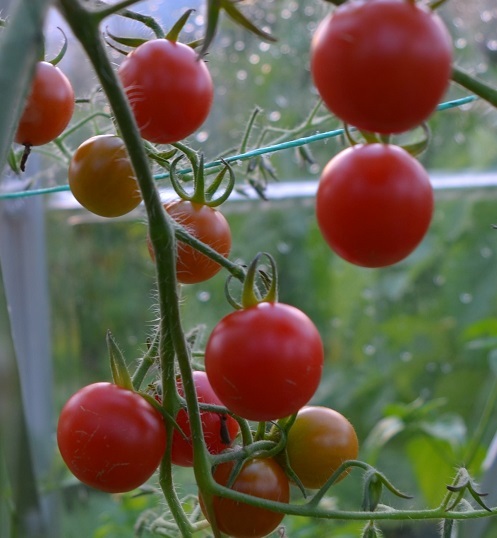 There are huge trusses on this, with large cherry tomatoes which are nicely balanced in flavour, both tart and sweet. 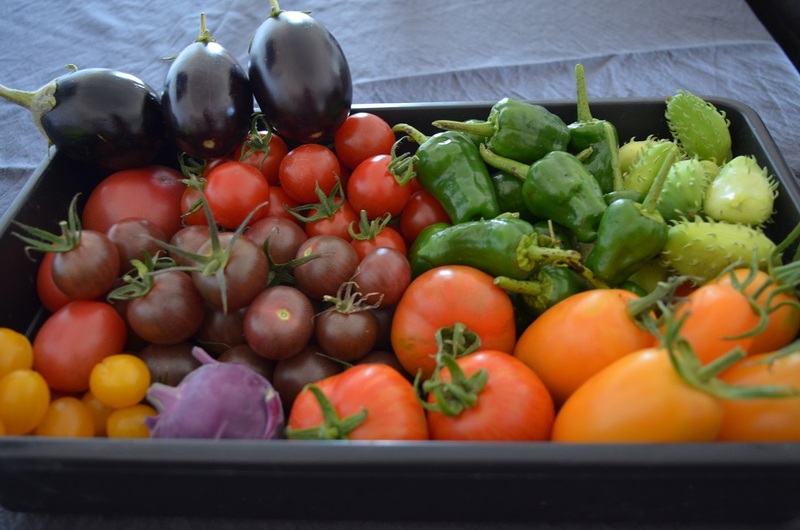 When I grew these outside last year, they and the Black Cherry were the last to get blight, though then the tomatoes were a lot smaller from being grown in the great outdoors and confined to pots. The greenhouse plant is now up to the roof. This is my only tumbler and I love the tiny, intense, sweet tomatoes, which are between the size of a 5p and a penny. I grow them in large pots, and the trusses usually tumble to about a foot below the base. The plant needs a bit of cossetting to grow massive and I haven’t managed to get that right this year, but it’s still chucking out lots of tomatoes. Seeds from the Forum seed circle. Wow, Beryl, what a collection. Makes me (almost) want to visit the metropolis! Well done indeed. Certainly beats Tivvy market….. Thanks! Curly leaves just seems to be a trait they have. None of my other tomatoes have it though. Mebbe it’s linked to the colour, some other blue tomatoes do the same.